Welcome to our website! The Richmond Musicians' Association, Local 123, American Federation of Musicians of The United States and Canada, was chartered in 1900 and for over 100 years has been the source for music teachers and professional musicians in Richmond and surrounding counties. The jurisdiction of Local 123 includes the following Virginia counties: Albermarle, Amelia, Amherst, Appomattox, Bedford, Brunswick, Buckingham, Campbell, Caroline, Charles City, Charlotte, Chesterfield, Cumberland, Dinwiddie, Essex, Floyd, Fluvanna, Franklin, Goochland, Greensville, Halifax, Hanover, Henrico, Henry, King and Queen, King William, Louisa, Lunenburg, Mecklenburg, Nelson, New Kent, Nottoway, Patrick, Pittsylvania, Powhatan, Prince Edward, Prince George, Roanoke, Spottsylvania, Surry, and Sussex. Membership is open to all instrumentalists and vocalists who work part-time or full-time in pop, rock, country, jazz, classical, folk or other areas of music making. 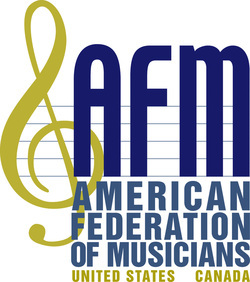 We are affiliated with the American Federation of Musicians of the United States and Canada (AFM). If you are outside of our jurisdiction and would like to find the local in your area, visit the AFM.org Website.